What kind of games do you like to play? Ball games, board games, games of luck? Interestingly, people who came to this land long time ago had this much in common with us - they also enjoyed games. Today I want to share several Native American games that your kids can play with friends or you can play as a family. They are perfect to celebrate Native American History Month. "Don't Know Much about Native Americans"
The Last of the Mohicans by James Fenimore Cooper. I read this book as a teenager and I remember crying over the fate of Uncas quite a bit. Soviet propaganda stories about all modern Native Americans (we called them Indians, because in Russian American Indians and Indian Indians are not the same word, so there is no confusion) gathered in reservations which I imagined being something just a step up over a concentration camp. When I came over to the United States, I lived in New York City, where I learned the story of how the Manhattan island was bought from local native tribes for ridiculously low amount of money (about $24), but East Coast Indians are long gone, victims of disease and forced removals. So, mostly I learned about Native Americans together with my daughter, because California public schools are big on Native American history. 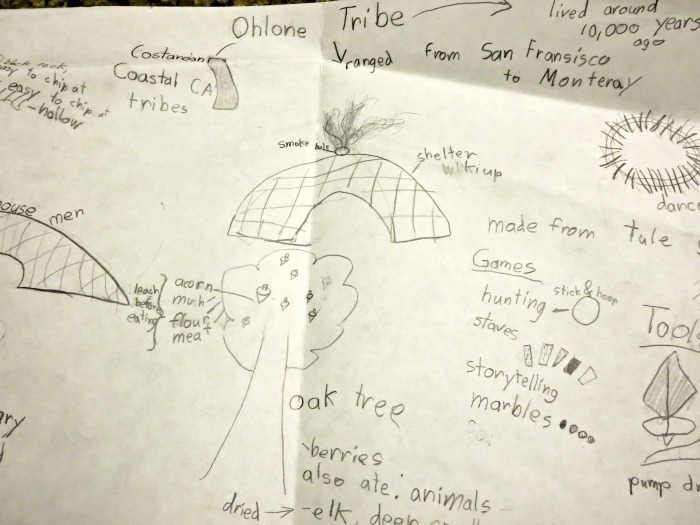 In the third grade, Smarty had an extensive study of a local Indian tribe, Ohlone Indians. Kids learned a lot about the way of life in Ohlone tribe including some information about Ohlone games. We even had a chance to do some hands-on history exploration by going on a field trip to the local "Indian Country" and meeting living members of Ohlone tribe. When Smarty learned about this game in school, it was named staves game. 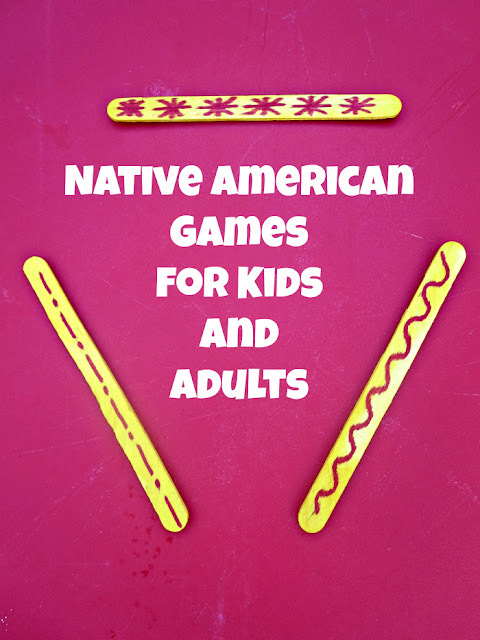 I've seen different names for it in my own research on Native American games for this post, but it looks like different versions of the same game were common across various tribes. 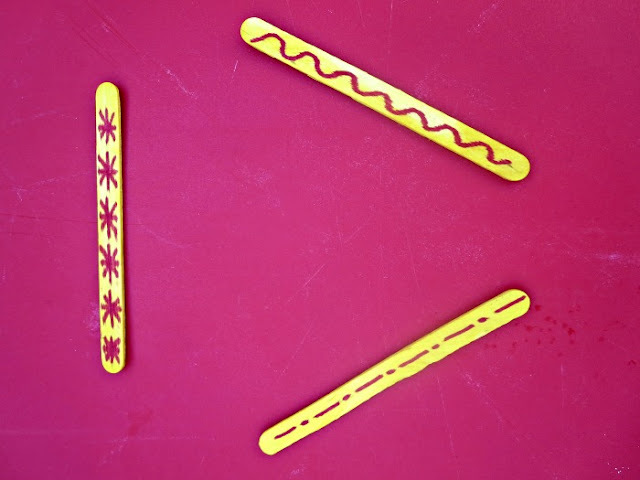 The playing pieces are essentially two-sided dice with one side colored (or, in some versions, rounded) and another side left without color or flat. Scoring also seems to differ significantly between versions as well as the number of playing pieces, but the game is easy to set up with craft sticks when only one side is decorated and another left bare. 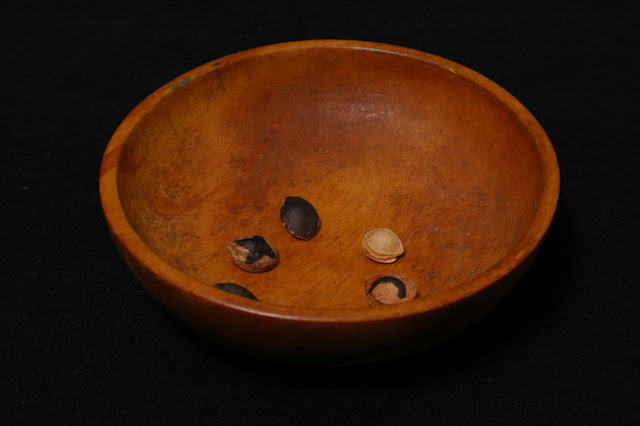 According to the history of the games, even though it looks like a game of chance, experienced players could consistently throw their sticks to land in a certain way, so in the past it was a game of skill, and not a game of chance. A Plum Stone game requires a shallow basket (a paper soup plate might be perfect for it) and five plum (or apricot) stones. Again, the rules vary widely within different tribes, but the prevalent idea is that one side is left a natural color (just like in staves), but 3 stones are painted with designs on the other side (or painted red) and 2 stones are painted white on the other side. The player shakes a basket with the objective to throw all stones in the air and then have them land back in the basket. Then the score is tallied - various combination earning different number of points. Smarty also really enjoyed a simple "mind reading" guessing game that is played with two marbles or stones of a different color. The lead person passes one marble to the next person and that person has to guess a color of the marble in his or her hand. If he/she chooses correctly, he gets both marbles and challenges the next person in line. If a guesser chooses incorrectly, she is out. Smarty was very pleased when she was one of the best "mind readers" when her class played that game. Perhaps she could be a spirit person if she were born a Native American in the times long past. 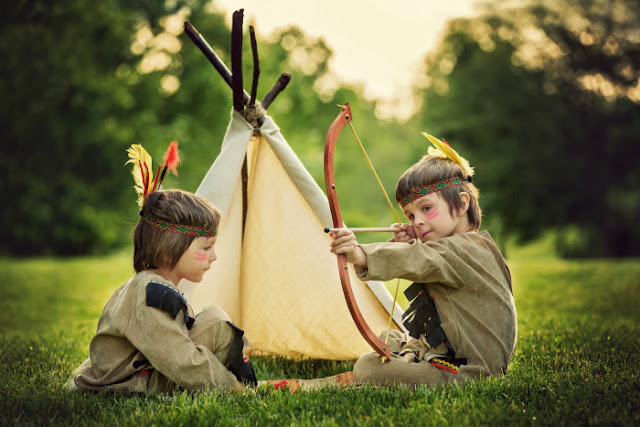 Did you learn a lot about Native Americans when you went to school? Or they have loaded staves???? I find this idea rather hilarious to play out in my mind. It may not be at all realistic, but it amuses me to think of it.